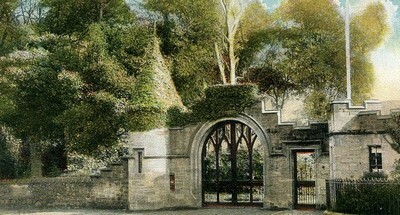 The Scottish king James VI called the ancient Pictish Kingdom of Fife " a beggar's mantle fringed with gold". 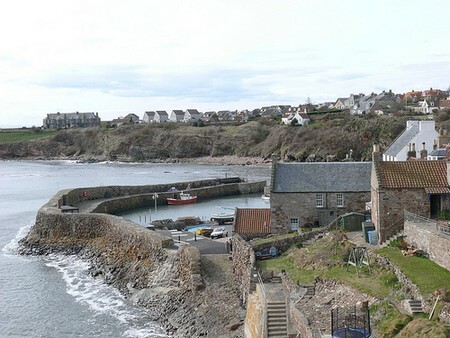 The frayed cloak is the ragged coastline of the begging hand Fife holds out into the sea, and the gold lining is made up of the fishing villages of this lovely Scottish coastal kingdom. 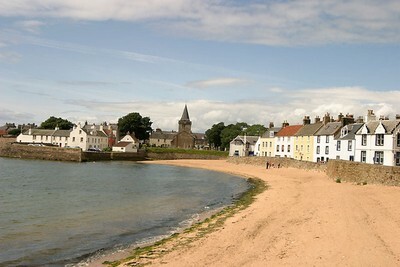 In fact Lower Largo in Fife is the birthplace of the real Robinson Crusoe, Alexander Selkirk, who was Daniel Defoe's inspiration for his famous character. 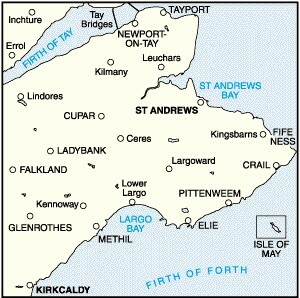 (see map for location of Lower Largo at bottom of page). Selkirk was a privateer, a sailor and a kind of nautical mercenary, who sailed from his native village of Lower Largo in Fife into adventure with the idea of attacking Spanish ships. 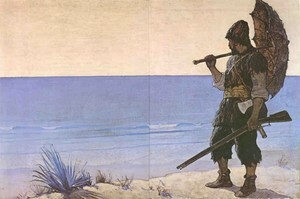 Unlike Robinson Crusoe, Selkirk was not actually shipwrecked, but purposely left on the Island of Juan Fernandez off the coast of Chile, when he questioned the sea-worthiness of his ship, the "Cinque Ports". Mistakenly believing another ship would be along soon to pick him up, he survived for four years until his eventual rescue, providing the story for Daniel Defoe's classic tale. Four years in the Kingdom of Fife however, would never be long enough to cover everything there is to see and experience. Driving across the bridge to Fife from my home town of Dundee over the Firth of Tay, upon arriving in Fife I always felt as if I had entered into a different dimension, where time stretched out, and an inexplicable feeling of relief hinted at endless possibilities for adventures. 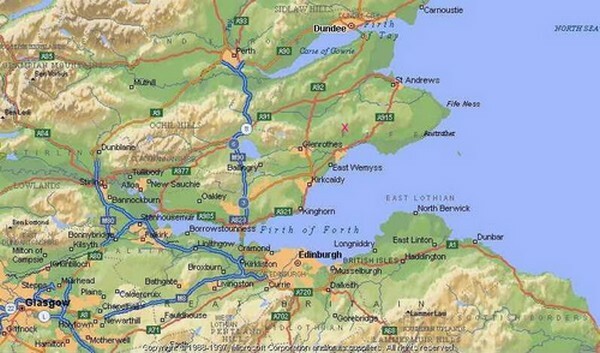 The feeling of apartness of the Kingdom of Fife is possibly explained by the the fact that it is physically separated from the rest of the country, and indeed the Kingdom of Fife was once a separate Pictish kingdom called "Fib". 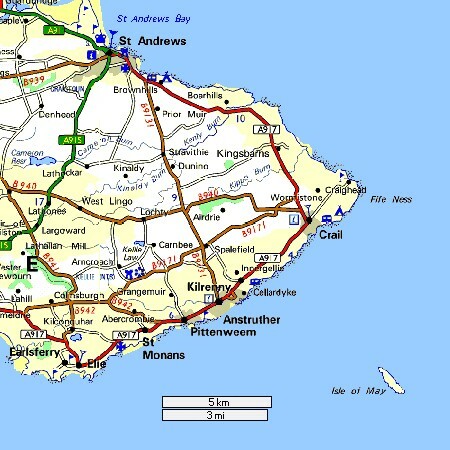 Recently an attempt was made to Anglify the Kingdom and call it Fifeshire, or just The County of Fife, but it cannot be compared with other Scottish counties, nor even the rest of Scotland. The strange fact remains that the Kingdom of Fife is referred to as just that to this day. For some inexplicable reason, it is simply unique and the Kingdom can apparently never be tamed. Although there are no jagged peaks or high mountains there, nor even the fierce beauty of northerly Scotland, Fife's mystique will draw you in and hold you there.. 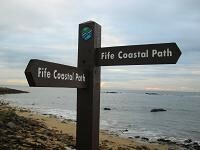 The luxury of time to explore will lead you to the Fife Coastal Path which is the best way to explore, on foot. The Path starts at the Forth Bridge on the Edinburgh side, and finishes at Dundee, on the Firth of Tay side, and is 80 miles long, but you can pick it up at any point, and walk for 30 minutes or a couple of hours. Walking the path will take you to the beaches, coves and inlets..show you the charm of the fishing villages and the people..and allow you to stay at the picturesque inns and pubs on the way. An added benefit is the best fish and chip shops anywhere, local fresh delicious fish..
A walk in the Kingdom of Fife is more than just a mere amble..it is more like walking through your own adventure story.. 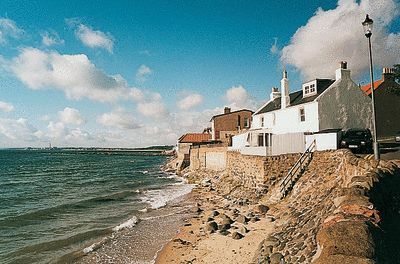 The East Neuk, or corner, of Fife is particularly beautiful and lies east of a line between Leven and St. Andrews. (See map at bottom of page). Here you will find small settlements around sheltered harbors. 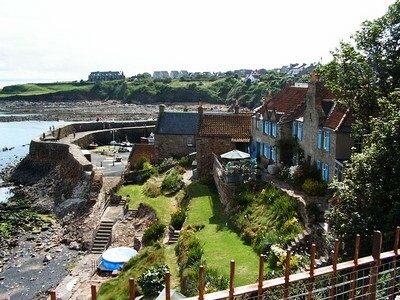 Most of Fife's fishing is carried out from Pittenweem and Anstruther. Anstruther is also a marina for pleasure craft and one of my favourite places. And it has some wonderful pubs!